US Flag Lapel Pins: For those who like to display their favorite symbol of patriotism. 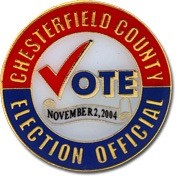 Vote Lapel Pins: For those who wish to motivate others to vote. While this is not a complete list, it does represent the majority of sub-themes inside the political lapel pins world of today’s marketplace. For assistance developing a political campaign lapel pin, call Sienna Pacific at 888-720-2115.